I am back at Boneca de Atauro for an artists residency, but mostly to help the ladies from Boneca to prepare for AQC in Melbourne in April. When I say an artists residency, this is very much a "community" based residency, in that I am here to help upskill techniques, teach some new things and brainstorm some new products that can be sold. This group of women, who live on a relatively isolated island formed a co-operative 11 years ago with help from Ester Peira Zuercher-Camponova and David Palazon, but also with a lot of their own initiative and determination. Atauro Island lies 25 kilometres off the coast of Dili, and it is only reachable by boat ( unless you happen to fly a single engined Cesna and are prepared for a rocky landing). The ferry takes 3.5 hours, and the Dragon boat and hour and a half. On this island which is r secluded from most of the tumult of the western world, making a living is incredibly difficult. Mostly life is subsistence and reliance on tourist dollars, which don't always come ( for example February is wet season and there are very few visitors). The island is a paradise for divers, but they are busy diving not spending tourist dollars. So it's remarkable that the Boneca co-operative manages to employ 62 women , of all ages and all skills, to be able to earn a sustainable living on their island and to have set up a shop in Dili and to now venture to Australia to show off their work and to hopefully sell their work so they can attain their dream of setting up a school to learn languages and other skills. They have vision and passion and are by far the most egalitarian organisation I have ever encountered. But we need help. I mentioned it in my last blog and will again. We are trying to fund raise two airfares and travel insurance for two of the ladies to come to Melbourne. We would like four ladies to come to Melbourne. We hope we have funding for two ladies already, but feel for them to get the full benefit of the experience we need to have four ladies at AQC so they can also enjoy the event a little as well as show you what they do. 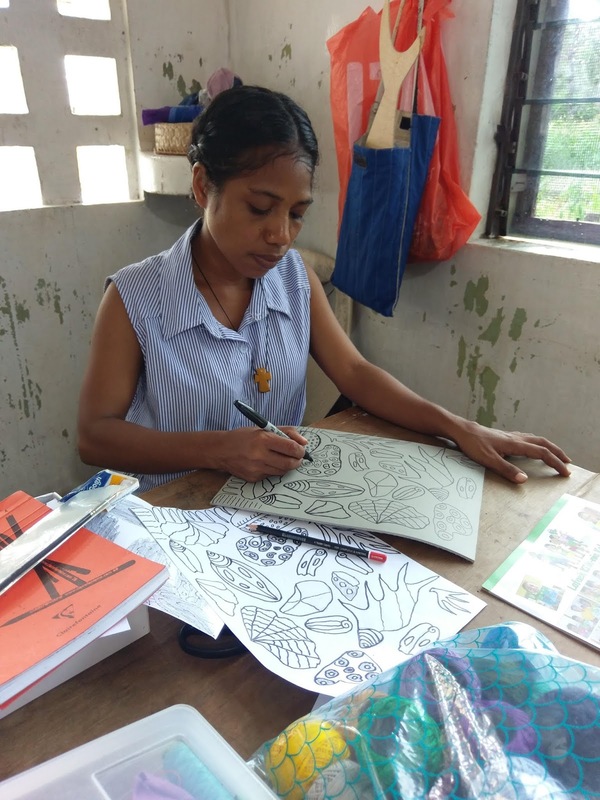 It is also incredibly important to reinforce the english language skills that they have been studying at an adult school in Dili- they are determined to be the best they can. Also they have never been to an event like this. They have been to a Tourist gift fair at Macau, but never to a textile industry specific fair. I am sure they will be amazed by what they encounter at AQC- simply the quilts will be inspiration. Looking on-line is not really an option ,as internet access is expensive comparatively and it is also 3G so on the slow side. Plus you need to remember to charge your phone at night because the generator that powers the island only runs from 6pm until 6am- so no power during the day. I was surprised to find that airfares from Dili to Melbourne have roughly increased by about 30-40% in the last year which is substantial- airfares are around $1000US flying with a reputable airline. This is a significant sum of money as you no doubt will have guessed. Already some of you have donated and I send you heartfelt thanks on behalf of the Boneca ladies. All monies donated will be put towards their travel expenses. It has been suggested I do a Go Fund Me campaign, but to be perfectly honest, my head was not in the right place to set it up , given I wasn't sure how I would cope with radiotherapy ( which did not finish until 8 January). And also internet access is varied on the island. The other thing about such campaigns is the platform does take a small percentage of donations ( which is fair enough given they provide the platform) and you have to reach your target. So we will try and do it this way and we would appreciate it of you could spare any amount of your choice, you simply click on the donate button. I work with a small group of women with the idea that they will teach some of the other women what they learn. Jacinta da Costa worked with me previously was incredibly motivated and an adept learner ( remember that exposure to anything art or textile at school is non-existent). She is also creating really wonderful linocuts and senses how some of these will translate with the application of stitch. She is also a very careful printer, a skill she has passed on to Agida in the photo below. I try to get the women to use their environment as inspiration and am constantly surprised and delighted with how they interpret their world. I love how their linocuts reflects them. This isn't about creating perfection but creating from the heart- from their island from their lives. The fabric in the image above is known as Rapan Hirik and is only made on Atauro Island ( the tais on "mainland" Timor Leste are made from cotton fibre and lately also with syntehtic fibres). 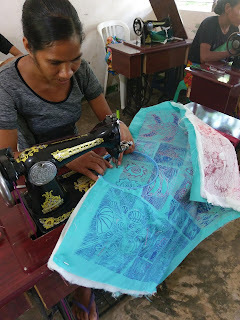 Until about 5 years ago there were only a few women on Atauro Island who made the rapan hirik fabric ( it is quite stiff but suprisingly pliable and can be stitched) in a village on the other side of the island .The island measures 25 km x 9km, and has a quite a big hill, well mountain smack bang in the middle of it. 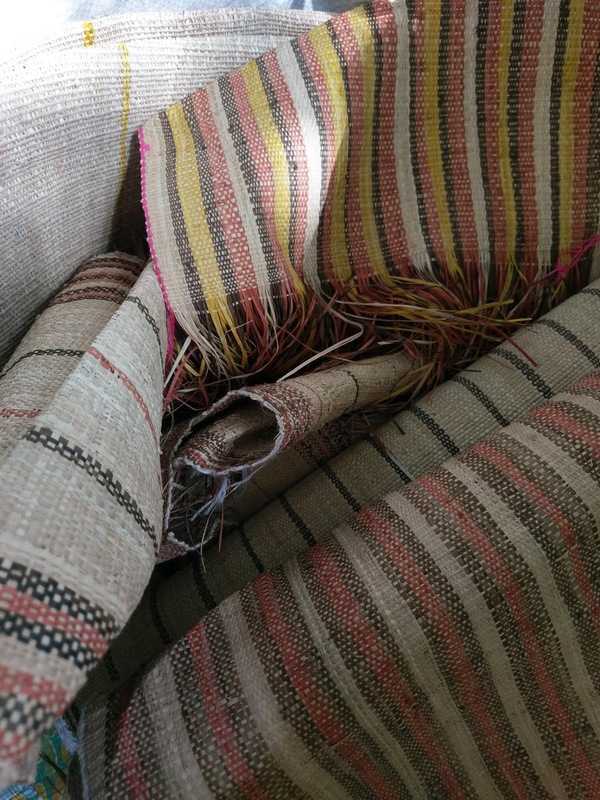 However since the women at Boneca have been using the rapan hirik fibre to make bags and pencil satchels there has been more weaving going on. 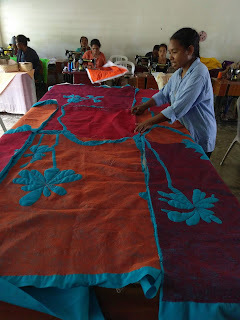 The fabric is woven on back looms. Maturina Aruajo is the head designer at Boneca- and her vision is big. This is her latest creation- the colour you see ( apart from the turquoise) is all stitching- all done on a treadle!!!! And it measures at least 2 metres long by 1.8 metres wide. 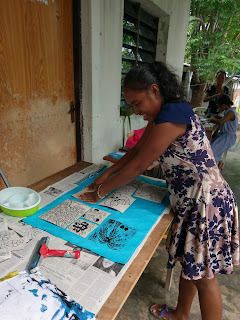 Eva is working on some of the linocut printed fabrics with the linocuts the women made when I was here in 2017. Again this is a treadle machine that Eva is working on, and her stitching skill- free motion is amazing! 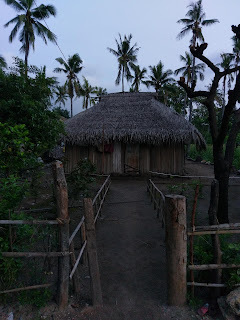 There are still a number of traditional houses on the Island ( I am staying in the town of Vila-Mau Meta) and this is one I encounter on my early morning walks. I love hearing about this project! What beautiful work! I hope you are not too weary from your treatments.